One of the biggest perks of a 401(k) is that most companies offer matching dollars. Although the amount of the match varies by company -- the standard formula is half of what you contribute, up to 6% of your salary -- one thing is certain: It's free money, and that's something you never want to pass up. Unfortunately, the financial crisis had many companies reconsidering their programs, and about 18% have either cut back or eliminated 401(k) matching dollars, according by Towers Watson. • Look at Other Benefits. 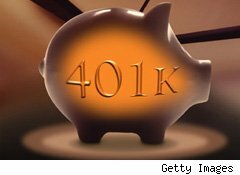 The 401(k) is a pretty lucrative investment vehicle, with or without matching dollars. For starters, it allows you to contribute $16,500 in 2010 ($22,000 if you're over 50), which is three times the amount of money you can put into any sort of IRA. Other pluses, says Jeff Bruce, a financial planner and the director of communications for Exemplar Financial Network, generally include no minimums, reduced costs, and loan features. Most plans allow you to borrow from your 401(k), then pay the amount back to yourself with interest. It's a somewhat risky move (if you lose your job, you generally have to pay the money back in under two months), but it's nice to have the option in case of an emergency. • Compare Investment Choices. Some 401(k)s offer wide menus of investment options, everything you need at a low cost. Others pale by comparison. When your options are bleak, an employer's matching dollars make up for it, but if those go away, the choices matter more. If you've struggled with your plan's investment choices before, take the first $5,000 ($6,000 if you're over 50) that you're contributing off the table and use it to open an IRA or Roth IRA instead. Then, put the rest of your retirement-designated funds into your 401(k) and pick the best of the options on your limited menu. Note: If your company has reduced, but not eliminated, the match, you want to flip this around: Contribute enough to your 401(k) to get the full match, then switch to the IRA, then go back to the 401(k) with what remains. • Consider an In-Service Distribution. You generally won't be able to roll over your 401(k) if you're still employed by the company that provides it, but an in-service distribution is allowed by most plans if you're over 55, says Bruce. "In other words, you're making a roll over of either the full amount or a percentage. At that age, you want to be more precise in your asset management." In other words, this is a good option if you don't like your 401(k)'s investment menu and you've lost matching dollars -- most IRA plans offer more freedom. If you want to find out more, call your plan's custodian. • Contribute More. Those matching dollars add up, and if they're gone, you need to pick up the slack. Chances are you've run some scenarios on your retirement. You've figured out how much money you need, and you've included matching dollars in those equations. Now you're going to have to figure out how much more you need to contribute to continue the momentum. It's simple math – if your employer was contributing 3% and you were contributing 12%, you need to bump up to 15% - but it can take some creative budgeting to come up with the extra cash. Comb over your expenses and see where you can cut back. When you come to something that's discretionary, think about whether or not you can eliminate that expense, or at least reduce it. So maybe you keep the cable, but cancel the HBO. • Keep It Up. Chances are, you'll see matching dollars again. The same Hewitt study found that 80% of the companies who cut or reduced matching contributions plan to bring them back. When that happens at your company, don't drop your contribution back down if you're not saving enough to meet your retirement needs without it. You've already adjusted to the new lifestyle, so why go back?